Let me first take the opportunity to thank the bloggers of TLH for welcoming me to this blog. A few might recognize me from americanturban.com, and I’m excited about the opportunity to engage with the audience on this blog in discussing many of the issues we face as a community, and particularly in the United States. Most of my early education in Sikh history came from comic books, namely those published by Amar Chitra Katha, based in India. My father purchased every title related to Sikhism that was released by this company — covering the stories of the Sikh Gurus to those of Sikh legends and heroes — and I loved reading and re-reading these comic books until I knew the stories by heart. It was a great introduction to Sikhism that captured my imagination. As I got older, I moved on from these comics to literary works on Sikh history that filled my growing mind with more knowledge and detail. I started reading those comic books almost 30 years ago (I’m astounded as I write that number), and I’ve recently come across a new effort to bring such Sikh stories to today’s young audiences. Gyan Khand Media has currently published three titles covering the stories of Baba Deep Singh, Guru Tegh Bahadur, and the Battle of Saragarhi. Many more are planned, and I had the opportunity to download and read the first two titles using Amazon’s Kindle appon my mobile device. I find the ability to download these comics and read on Kindle or other mobile device to be very convenient. The electronic versions allow the reader to carry the entire collection on one device (as compared to my old Amar Chitra Katha comic books, which are all in a large box). Hard copy (paper versions) of the comics are also available for those who aren’t so inclined to read these comics electronically, but to collect these on a tablet or a Kindle reader makes these comics very convenient. I am also impressed with the vibrant artwork presented in these comics. They are clear, colorful and uncluttered. The images are of professional quality, which make the comics easy to enjoy, and the language is more palatable to a western audience than you might find in other Indian publications. The comics also include actual dates for many events that are portrayed so the reader can learn of important anniversaries and milestones. In my estimation, the writing would be at the level of an older child but may not be as easily understood by very young children. While I’m not an expert on Sikh history, I found that Gyan Khand Media’s comics represent what I know of Sikh history fairly well. The plot details seem consistent with commonly recognized stories and historical facts. One aspect that I particularly liked was the inclusion of appropriate excerpts from the Guru Granth Sahib in many of the comic’s vignettes, connecting for the reader what they are reading with teachings from the Sikh holy book. This is a novel way to introduce children to the teachings of the Guru Granth Sahib alongside historical examples. The prices of these publications are very reasonable: currently at $3.99 each, which is hardly a prohibitive cost. For that price, while some might expect otherwise for a publication shipping from India, the materials are reported to be of high quality. All in all, I liked these comic books and think they would be a valuable resource to the personal libraries of anyone who wishes to teach their children Sikh history and philosophy. For more information, visit sikhcomics.com. I just finished reading "The Battle of Saragarhi" from www.SikhComics.com. It's one of several inspiring new comics from writer Daljeet Singh Sidhu, artist Amarjit Virdi and their SikhComics team. It's a rare teacher who can bring history to life in such a vivid manner, and though I knew of the battle of Saragarhi, I had no visual memory to go with it. Pictures make a big difference! This tale of bravery, fearlessness and courage in the face of overwhelming odds is both magnificent and inspiring! What a great way to teach our history to our children. 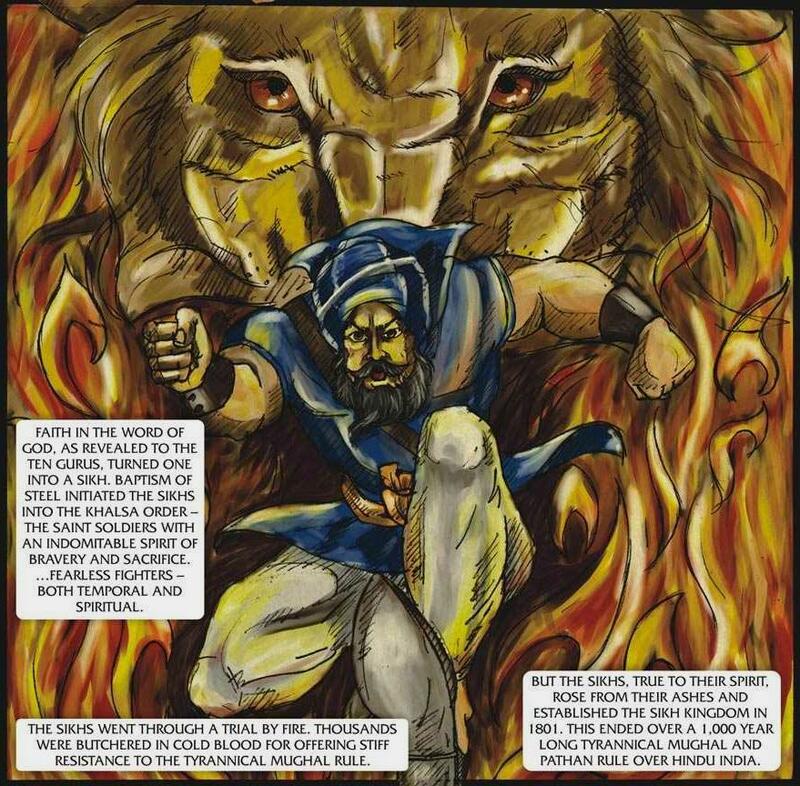 The SikhComics team is doing the same thing we are doing at SikhNet with our audio stories for children - inspiring, entertaining and engaging youth with the timeless tales of spiritual, moral and warrior saint leaders who serve as examples for all of us. The battle of Saragarhi has few parallels in the history of the world. This battle certainly puts to disadvantage, many celebrated battles in the west that have received greater attention from the world than the heroism of this small contingent. What inspired these men to such an unbelievable act of courage, well beyond the call of duty is not hard to imagine, if one understands the values and philosophy of their Sikh faith, and its glorious history. Twenty-one Sikhs that laid down their lives at Saragarhi had displayed unflinching determination and courage against well-armed Afghans and Pathan tribesmen, over 500 times their size. They were all awarded the Indian Order of Merit, the highest gallantry award an Indian soldier could receive from the British crown. Dependents of each dead soldier were awarded fifty acres of land and five hundred rupees. A cairn was constructed at the site of the battle to honor the valiant soldiers of the 36th Sikh. Bricks and stones were used from the demolished fort of Saragarhi. To commemorate these men, the British also built a Gurudwara, the Sikh place of worship, and raised a tablet at Ferozepur, the district most of the martyrs of Saragarhi hailed from. Over the next fifty years more than 300.000 Sikhs served in the British army. In the last two world wars about 83,000 turban wearing Sikh soldiers were killed and close to 109,000 were wounded. In 1947. when the British left India, the Sikhs constituted about 35% of the Indian army even though they were only about 2% of the nation's population. Every Indian should be proud of these men and every Sikh grateful to have been imbibed with the same spirit as these 21 martyrs of Saragarhi. Nineteen years later. Dafadar Natha Singh, a Sikh soldier of 2nd Lancers summed up well, this unique Sikh warrior spirit. He who dies on the field of battle. He has only one aim - victory. The Battle of Saragarhi, along with the other comics from www.SikhComics.com are available at their web site as well as at www.Amazon.com and other booksellers. I highly recommend them.